Unity is what Muslims need most at this juncture and fuelling differences is tantamount to ignorance, former president Hashemi Rafsanjani says. He touched upon what is currently happening in Occupied Palestine and warned Islamic governments that when world powers ignore diplomatic norms and human laws to lend full support to crimes committed at the hands of Zionists and provide the Tel Aviv regime with assistance, any move that creates religious and tribal differences in the ranks of Muslims is tantamount to political ignorance. He recalled the emphasis the Supreme Leader laid on Muslim unity in a meeting with members of the Assembly of Experts and said Ayatollah Khamenei blames the problems of Muslims on extremist attitudes among both Shiites and Sunnis. The top councilor then said the fact that extremists think they are serving the interests of Islam through their acts lies at the center of the problems the world of Islam is grappling with. Mr. Rafsanjani said that up to 1.7 billion Muslims currently live in 60 Islamic countries around the globe, and that despite enjoying big political and human capital, the Islamic world is witnessing crimes by Zionists against defenseless Gazans, including women and children. He then condemned the support the US president lends to the usurping regime in Tel Aviv and said it defies the standards of human ethics to help criminals kill innocent people. Recalling the fact that Sunni Muslims live in the country’s border provinces, the chairman of the Expediency Council said such presence is indicative of the peak of their nationalist zeal and shows that despite the publicity hype of the enemy, they are there to safeguard the territorial integrity of the country. 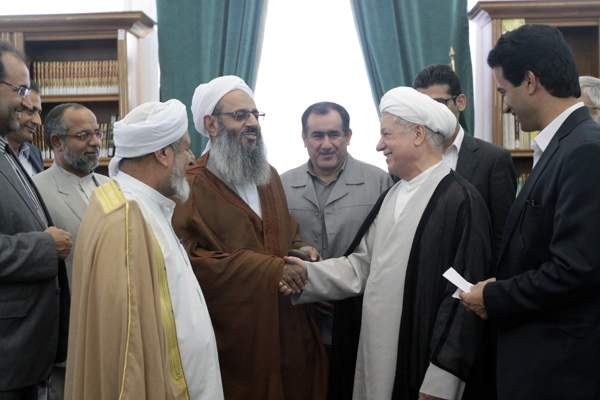 Prior to Mr. Rafsanjani’s remarks, some participants including Sunni prayer leaders and past and present MPs representing Sunni Muslims in parliament […] spoke about the necessity of Shiite-Sunni unity, importance of meritocracy and significance of steering clear of extremism.